Any adult remembers all too well how difficult middle school can be – managing relationships with peers, dealing with new hormones and generally, finding your way as you become a young adult. 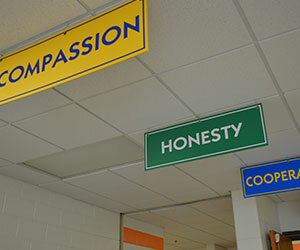 Gahanna Middle School South is tackling this time of transition head-on by implementing several changes over the past year to enhance the school’s culture and support positive behaviors. It’s working, and it's earning them statewide recognition. The school will receive a bronze recognition award in November at the 2018 Ohio PBIS Showcase – PBIS stands for Positive Behavior Interventions and Supports. Each year the showcase is held to recognize the efforts of school districts implementing PBIS and meeting the quality standards created by the Ohio Department of Education. In addition, the PBIS team at Gahanna Middle School South will share their learnings with other educators attending the showcase. “The biggest and most important change we made was a mindset shift. Focus used to be on creating a list of rules and telling students what NOT to do. We still use a code of conduct, of course, but our focus is on teaching them desired behaviors,” said Todd Keenan, assistant principal at Middle School South. 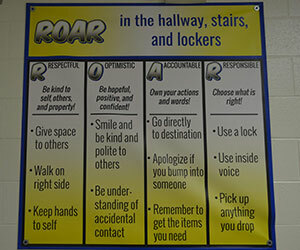 The school started the ROAR program where students learn positive behaviors such as being Respectful, Optimistic, Accountable and Responsible. The school is filled with ROAR signage, the teachers promote it in their classrooms and monthly guest speakers are brought in to underscore the message. 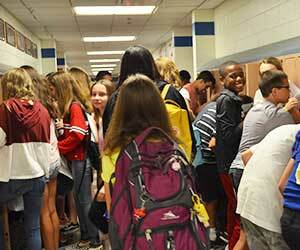 In addition, the school changed its entire hallway layout to create a more unified school building. Rather than 6th, 7th and 8th grade wings, the school is now set up according to subject matter, mixing all grade levels to reduce class/peer drama. To learn more, check out this video from last school year. According to Keenan, from the 2016-17 to 2017-18 school year, the number of discipline incidents has decreased in every category (detentions, in-school restrictions, out of school suspensions, Saturday school). Even more importantly, staff are being more cognizant about identifying and reinforcing positive student behavior. “The award is a reflection of the work of the PBIS team, the staff at GMSS and contributions of our students and support of the parents. It is an affirmation that our efforts towards creating a more positive school culture and focusing on reinforcing positive behavior among our staff and students are effective,” said Keenan.